Akumal, Our little spot in Mexico. Melissa and I have always had a love for Mexico. We first went to Mexico on our honeymoon in 2008 and have been back almost every year since. It's a short 3 hour flight away from DFW, very affordable, great food, the people are amazing, it has some of the most beautiful beaches in the world, and is home to a little slice of heaven called Akumal. Akumal is a small secluded beach town an hour and a half South of Cancun that we discovered through an adventure outing on one of our early trips to the Riviera Maya. On that trip we fell in love with this little town and have made it our yearly vacation spot. On a family trip to the Riviera Maya we booked an excursion to go snorkeling with sea turtles through a company called Ed-venture. Ed-ventures has a reputation for taking your places off the beaten path and avoiding big tourist attractions, so we were excited to see where they would take us. They picked us up at our resort (45min South of Cancun) and drove us to the small town of Akumal (1 hour 30 min South of Cancun). It is small quiet secluded town that sits on 2 of the most beautiful beaches (Half Moon Bay & Akumal Bay) that I have ever seen. The name Akumal means "Place of the Turtle", because it is one of the main breeding and nesting ground for sea turtles in the Mexico Caribbean. Every year hundreds of turtles come to the Akumal bay to eat, mate, and lay their eggs. 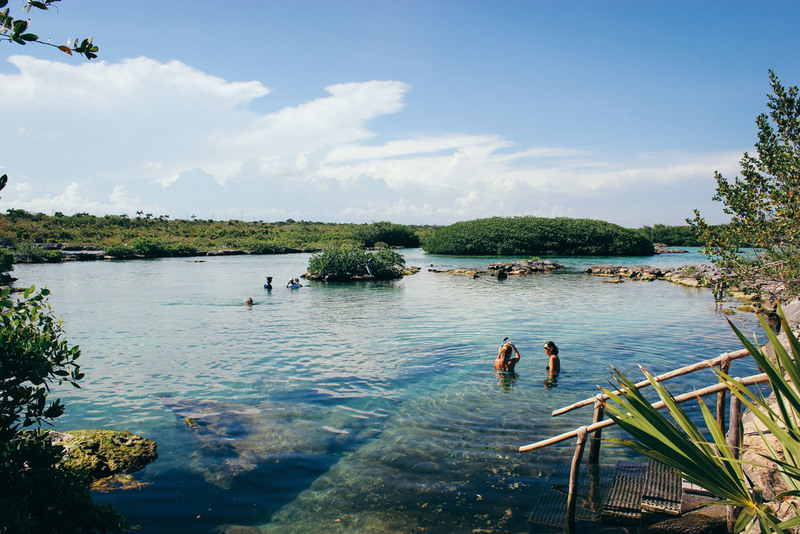 We drove into the small town, parked, and then walked across the street onto the pristine Akumal Bay. The beach was beautiful! White sand, calm clear waters, coconut trees, and very few people. We immediately jumped in and snorkeled out into the heart of the bay where the water was crystal clear, warm, and smooth as glass. 100 yards out past the beach, the sandy flat bottom transitioned to sea grass. This particular sea grass is a favorite food and hot spot for giant sea turtles. At any given time you find yourself swimming side by side giant (3ft - 6ft) sea turtles. I had seen turtles in pictures, but I had never before been this close to the majestic creatures. They are slow, docile, and are just hanging out chomping on sea grass. I was blown away by how big they were and how close we were to them. You could literally reach out an touch them (although you are encouraged not to disturb them). After we snorkeled with the turtles we swam down to a cluster of reefs on the outside of the bay. The reefs were exploding with beautiful tropical fish and even had a few small caves you could dive down into and pop up on the other side. From there our guide took us to Yal Kul Lagoon, a private lagoon just up the road past the two bays. This tranquil lagoon had bright blue clear water that was cooler than the bay water and had a totally different variety of colored fish. Between the bay and the lagoon, it was some of my favorite snorkeling I have ever done. By that point, we had worked up quite a hunger from snorkeling all day long. Our guide took us to restaurant up the road called La Buena Vida. 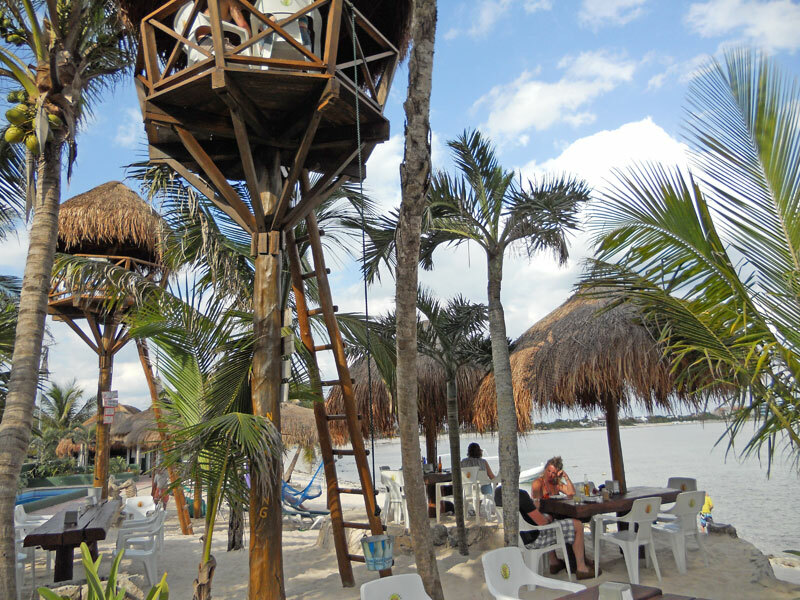 La Buena Vida sits right on the water of Half Moon Bay and the majority of the restaurant is outside. It is the type of place where you take your shoes off and dig your toes are in the sand. It has a great funky vibe, killer (and strong) margaritas, fresh ceviche, homemade guacamole & chips, and some of the tastiest Mexican food I have ever had. It even has hammocks for lounging and a couple tree houses that you can climb up and hang out in; complete with a bucket on a rope they will fill up w/ beer and you can haul right up. After eating one of the best meals of my life (fresh ceviche, chicken w/ mole, and a few top shelf margaritas) all while looking at the beautiful view of Half Moon bay with a great breeze blowing. Needless to say I was sold. Akumal was officially my new favorite place. At that moment, with our toes in the sand, sipping on a great margarita, exhausted from a day of snorkeling, Melissa and I vowed that we would come back to Akumal. It is a magical place unlike anywhere else we had ever been. That following year we came back with my family and rented a house within the walking distance of La Buena Vida. We had an amazing time getting to hang out and explore this beautiful little town. The next two years we came back with the Williams (our best friends, neighbors, and my business partner). Akumal has become "Our little spot in Mexico"; as we have now been 4 times. We have now figured out some great spots, some fun things to do and have really gotten the hang of making the trip there. On the next blog, I will will walk you through a "how to" of Akumal with some of our favorite spots and things you must do.